This mosaic is usually displayed in Edgbaston, Birmingham but was taken down to for the 2012 Hampton Court and Tatton Flower Shows, to form part of the Urban Oasis Gardens, designed by Chris Beardshaw for Groundwork and the RHS, sponsored by Marks and Spencer's. In liaison with Jackie Nash, the community of Edgbaston came together to produce this mosaic which depicts pertinent sites in their area. Everyone not only learnt new skills, but the project really helped to unite the community, young and old. The mosaic has hepled to enrich their environment and has become a focal point that everyone is very proud of. 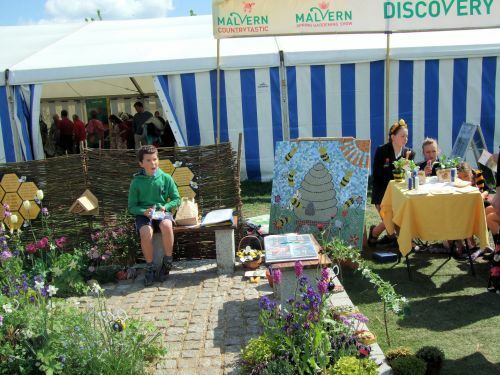 This mosaic was produced by the children at Bromsgrove School in liaison with Jackie Nash for their garden at the 2012 Malvern Flower show. The mosaic is now displayed within the school grounds.